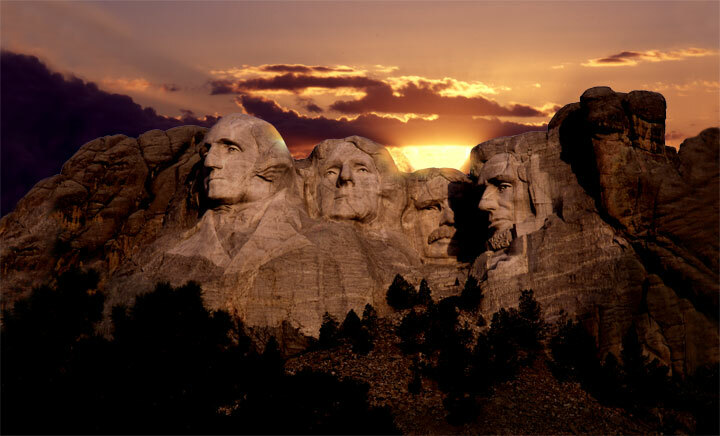 South Dakota—Carved into the Black Hills of South Dakota are the iconic faces of four former presidents of the United States–George Washington, Thomas Jefferson, Theodore Roosevelt, and Abraham Lincoln. These men were chosen to represent the first 150 years of American history and America’s cultural heritage. This photograph, created in 1999, is a double exposure. While the sun set the camera was positioned and a film frame exposed. After sunset when the park service lights came on a much longer exposure was made, on the same film frame, adding to it lighted the presidents. Exposures made on Velvia 100 roll film employing Mamiya RZ67 with 127mm lens. How appropriate for Presidents Day. Such a beautiful and moving photograph. What a fabulous place and awesome photo. You never cease to amaze me. I agree with Kate, above, perfect commemoration of President’s Day.